“Don’t get mad, get even.” That’s the apparent mantra of Wild Tales – Argentina’s submission for the Best Foreign Language Film Oscar in 2015. An anthology comprising of six stories connected by a common theme: revenge. The presentation is constructed much in the same way as a collection Twilight Zone episodes strung together. The very best have an underlying sense of humor that offsets the negative view that humans are nothing more than savage beasts. Indeed, photos of wildlife are subtly inserted in the background during the opening credits. The chronicle commences with “Pasternak”. It’s the shortest segment, but one of the most effective. The story immediately grabs the viewer’s attention with its anecdote of two passengers on a plane united by a startling coincidence. The last freeze frame shot brilliantly begins the production on the right note – wicked farce. “The Rats”, and “Road To Hell” maintain that sense. In the latter, an altercation between two drivers is like a modern day Western. Their duel escalates into a battling game of one-upmanship. There is giddy anticipation as to how far they’ll go. The next three are a bit longer. “Bombita”, number four, details the rising frustrations of a man brought to the brink by one misfortune after another. It’s triggered when his car is towed. A man at odds with government bureaucracy immediately recalls Michael Douglas in Joel Schumacher’s Falling Down. “The Deal“, about a wealthy father trying to keep his spoiled rich son out of jail has a heavy-handed ending that kind of kills the winking spirit of the piece. It’s at this fifth tale where the drama starts to drag a bit under the movie’s extended length. However it all ends on a suitably funny note with “Til Death Do Us Part“. A bride discovers her husband-to-be’s infidelity at their wedding reception and reacts accordingly. The party descends into chaos with amusing results. Wild Tales contends that human beings are merely separated by a thin line between societal norms and raging beasts. These six sagas of revenge highlight this fact. The most successful of which suffuse their bleak takes on life with comedy. Damián Szifrón writes and directs this glossy picture co-produced by Pedro Almodóvar. Stunning cinematography by Javier Juliá gives these dark comedies a picturesque quality that lightens the mood. A memorable score by Gustavo Santaolalla beautifully complements the production. Occasionally the tone gets nasty. There is a delicate balance between comedy and ugliness. It’s the twisted humor that redeems these misanthropic sagas. More often than not, the strength of the composition outweighs the occasional lapse. I didn’t expect the “Love Theme From Flashdance” to pop up in one segment but its playful moments like that which uplift a gloomy narrative. Those lighthearted touches keep these 6 unexpected tales of retribution consistently entertaining. This entry was posted on March 9, 2015 at 3:34 pm and is filed under Comedy, Drama, Thriller with tags 2015. You can follow any responses to this entry through the RSS 2.0 feed. You can leave a response, or trackback from your own site. Great review. This was such a fun movie! 🙂 Had a blast. This took me back to anthology pictures from the early 80s like Creepshow and Twilight Zone: The Movie. I loved that. Saw a preview of this before The Duke of Burgundy, they played the entire Paternak piece out. Loved it. It’s out here in a couple of weeks, cannot wait. It’s got a sense of humor. That’s what really sells these stories. Interesting, I think I may give this a shot this Friday. This, ‘While We’re Young,’ ‘Danny Collins’ and ‘Woman in Gold’ are all opening at our indie house and I’m debating between which to see first. Initially it was the obvious; I want to see Al Pacino take on Danny Collins. (I’m mostly going on trailers at this point, I don’t know much about this musician at all.) But I’m intrigued by both the set-up of this film and the fact RT critics/audiences are raving about it equally. 95 and 94% respectively? Wow. Until your comment I had no idea that the movie Danny Collins was inspired by the true story of a folk singer named Steve Tilston. I keep getting the film confused with something Pacino did last year called The Humbling. That got really bad reviews. Didn’t realize While We’re Young had FINALLY expanded into wide release. Not a fan of Noah Baumbach, but Frances Ha was cute so maybe I’ll give his latest a chance. Nice to see Wild Tales is still expanding to more theaters. I think you’d really enjoy this one a lot. Still haven’t seen this one. But I will. Sounds like fun. An anthology of stories connected by the common theme of revenge seems like a fantastic concept. The story about dueling drivers sounds especially fun and I’m sure I’d like the tale that recalls Michael Douglass in Falling Down. 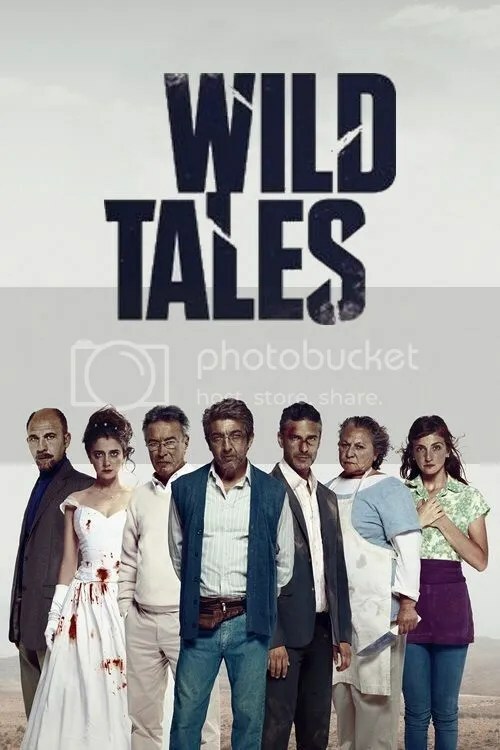 Based on your descriptions, Wild Tales just sounds like a well-crafted film on a technical level with some interesting things to say about human beings that could be bleak if they weren’t effectively balanced by humor by the movie. Adding it to my list to see. It has a wicked sense of humor.